AC2 A.Jackson of No 29 Squadron was shot down and killed in error on the 13th of October 1940 by Hurricanes off Point Ayr, Wirral at 18:00hrs in a Blenheim If (L6637) the rest of the crew Sgt R.E.Stevens and Sgt O.K.Sly were also killed. Patrick Geraint 'Jamie' Jameson was born in Wellington, New Zealand on November 10 1912, Jameson was educated in Lower Hutt before taking up employment as an assurance clerk. He learned to fly at the Wellington Aero Club in 1933 before leaving New Zealand in the January of 1936 to join the RAF. He completing his flying training in January 1937 and was posted to No 46 Squadron. 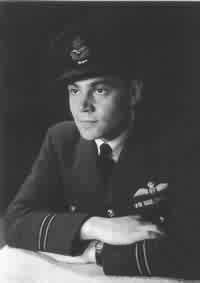 Whilst he was stationed at Digby, Jameson became friends with Cobber Kain, a member of No 73 Squadron. In the campaign of Norway he destroyed a Ju 88 and had a share in two Dornier Do 26 flying boats. In June it was decided to evacuate Norway and No 46 Squadron covered the withdrawal. On the 7th of June it landed its Hurricanes back on the flight deck of the 'Glorious'. This was achieved by fixing sandbags under the tailplanes to shorten the landing run. The carrier was sunk by the German battle cruisers 'Scharnhorst' and 'Gneisenau' with shell fire. Jameson and his CO found themselves on a Carley float with thirty others. After three days drifting in the cold sea only seven men were alive to be picked up, the two RAF pilots being the only surviving pilots of the unit. For his services in Norway Jameson was awarded the D.F.C. in July. When he was fit again, he took command of No 266 Squadron in September 1940. Jameson retired as an Air Commodore, and returned to live in New Zealand. F/O Jerzy S.Jankiewicz from Poland flew with No 601 Squadron. He was wounded on the 4th of September 1940 at 13:45hrs. His Hurricane I (R4214) was damaged in combat with a Bf 110 over Worthing. He later joined No 303 Squadron and in July 1941 took over command. He was the first Polish pilot to command a British manned Squadron and was also the first to lead a British manned wing on operations. He was killed on the 25th of May 1942 during 'Rodeo 51' over Gravelines in a Spitfire VB (AD233). His tally of kills was 4 confirmed. F/O Wojciech Januszewicz from Poland flew with No 303 Squadron. He was on patrol on the 5th of October in his Hurricane I (P3892) over Kent. He was shot down and killed by a Bf 109 at 12:00hrs over Stowting, Kent. His score stood at 4 confirmed kills. F/Lt F.Jastrzebski from Poland of No 302 Squadron was K.I.A. on the 25th of October 1940. He failed to return after a patrol over the Channel in his Hurricane I (V7593). F/O M.Jebb of No 501 Squadron was wounded in France when he crash landed due to gunfire from the ground on the 20th of May 1940. He was injured when his Hurricane I (N2705) crashed near Dartford on the 15th of September 1940 at 14:45hrs after combat. M.Jebb died from his injuries on the 19th of September 1940. F/Lt. Jessard Jefferies (ex. J.LATMER) flew with No 310 Squadron in Hurricane's during the Battle of Britain. He was awarded the D.F.C. for shooting down 4 enemy aircraft and damaging 2 others. F/O A.J.O.Jeffrey D.F.C. of No 64 Squadron was killed on the 25th of July 1940 when his Spitfire I (P9369) was shot down in combat off Dover at 14:55hrs. He is buried at Vlissingen, The Netherlands. Sgt C.W.Jefferys of No 46 Squadron in a Hurricane I (V7442) was on patrol on the 18th of September 1940. He baled out while in combat but his parachute did not deploy and he was killed at Chatham, Kent, at 12:30hrs. Sgt. Jözeph Jeka from Poland flew Hurricane's with No 238 Squadron during the Battle of Britain and was credited with 7 kills 1 shared an 3 damaged. his last rank attained in the R.A.F. was squadron Leader. Post war he was the first Polish pilot to fly at more than Mach 2. He was killed in a Lockheed U2 spy plane mission for the Americans. P/O D.N.O.Jenkins of No 253 Squadron baled out of his Hurricane I (P9321) on the 30th of August 1940 at 11:20hrs. He was killed by a German fighter over Redhill. Sgt M.Jiroudek a Czech. of No 310 Squadron was shot down over Sittingbourne by British A.A. fire on the 5th of November 1940. He escaped injury. P/O C.E.Johnson of No 264 Squadron and his pilot P/O P.L.Kenner were killed on the 28th of August 1940 at 08:55hrs. Their Defiant I (L7026) was shot down by a Bf 109 of JG 26 over Thanet. P/O James Edgar Johnson was born in Melton Mowbray on the 9th of March 1915, a police inspectors son. He joined No 616 Squadron in Spitfire's on the 2nd of September 1940. Sgt J.I.Johnson from No 222 Squadron was shot down and killed in his Spitfire I (R6629) by a Bf 109 at Bishopsbourne, Kent on the 30th of August 1940. P/O James Thomas Johnston a Canadian was posted to No 151 Squadron on the 13th of July 1940 without ever having flown a Hurricane. A pilot of No 56 Squadron, Pilot Officer F.B.Sutton, who was non-operational due to being wounded in France, was assigned to convert him and another pilot, P/O J.L.W.Ellacombe. On the 15th of August 1940 Johnston's Hurricane ( P3941) was shot down by Bf 109's off Dymchurch at 19:15hrs and crashed into the Channel. He was dead when picked up. He was 26. Sgt R.B.Johnson of No 222 Squadron was injured on the 3rd of September 1940 when his Spitfire I (L1010) suffered a Glycol leak. He baled out over Burnham on Crouch at 07:30hrs. He was shot down on the 14th of September 1940 and he baled out of his Spitfire I (X4249) after combat with a Bf 109 over Aveley, Essex at 16:20hrs. He escaped unhurt. P/O S.F.F.Johnson who served with No 600 Squadron in Blenheim's during the Battle of Britain was killed on the 26th of February 1941, aged 25 flying in a Defiant I (N3520). P/O J.S.B.Jones of No 152 Squadron was shot down and killed in his Spitfire I (R6614) by a Bf 109 on the 11th of August 1940 over the Channel at 11:00hrs. J.S.B.Jones is buried at St Marie, Le Harve, France. He was 21 years old. P/O J.T.Jones of No 264 Squadron and his gunner (W.A.Ponting) were killed on the 24th of August 1940 at 12:40hrs off Ramsgate. Their Defiant (L6966) was shot down in combat with a Ju 88 and a Bf 109's of JG 3. P/O R.E.Jones of No 605 Squadron was injured on the 15th of September 1940 at 11:40hrs. He had been scrambled at 11:15hrs to meet a formation of 30 Do 17's and some 70 Bf 109's. His Hurricane I (L2122) was hit and he baled out, his aircraft came to rest at Plaxtol, Kent. P/O Richard Leoline Jones fought throughout the Battle of Britain with No 64 Squadron & No 19 Squadron in Spitfires. Later in the war he became a test pilot with De Haviland. P/O W.R.Jones of No 266 Squadron shared in the shooting down of a He 115 off Dunkirk on 15th of August. In 1944 and 1945 he carried out many "special flights" to southern France, Belgium, Holland and Germany carrying "important passengers". Jones was awarded the A.F.C. on the 1st of January 1946. P/O Alexis Jottard a Belgian he flew with the Belgian Air Force in a Fiat CR23 before the Battle of Britain. He and his friend ( J.Offenberg) went on to France when Belgium was over-run, then when the French signed the Armistice they headed for North Africa. They were then smuggled to from Casablanca to Gibraltar with some Polish Pilots. They joined No 145 Squadron at Drem, in Scotland on the 17th of August 1940. A.Jottard was shot down and killed in his Hurricane I (P3167) by a Bf 109 on the 27th of October 1940 at 17:15hrs off the Isle of Wight. P/O C.C.O.Joubert of No 56 Squadron was in combat on the 13th of August when the radiator on his Hurricane I (P3479) exploded as he was attacked by a Bf 110. He baled near Rochford, Essex at 16:15hrs out slightly injured. Sgt. Leonard 'Joey' Jowitt joined the R.A.F. at 16 as an aircraft apprentice. He served in India and on his return in 1937 trained as a fighter pilot. He then joined No 85 Squadron and was flying patrol on the 12th of July 1940 in his Hurricane I (P2557). 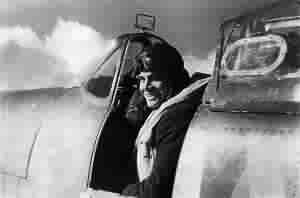 He crashed into the sea off Felixstowe at 08:50 after attacking a Heinkel He 111 of II Gruppe of KG 53 and was killed. His body was never recovered.